Intrigued by this type of melon that I always see at my local wet market, I decided to give it a try today. 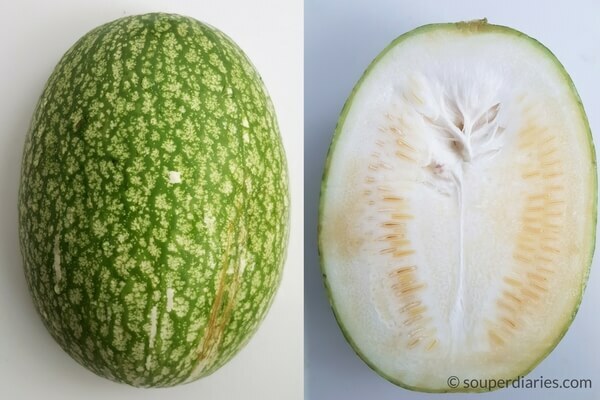 This melon is called shark’s fin melon because (you may have guessed it) when it is cooked, the melon flesh will turn to strands resembling shark’s fins. In vegetarian meals, shark fin melon is used as an alternative to the real McCoy as it looks similar to shark’s fin soup. This article was first posted on March 17, 2016. Updated on November 30, 2016 with improved recipe and pictures. What is Shark Fin Melon? A hardy vegetable, shark fin melon (scientific name Cucurbita ficifolia) can last without decomposing for several years if kept dry after harvest! Eating shark fin melon is said to help people with diabetes due to its high D-Chiro-Inositol content as explained in Wiki. It is also low in calories making it suitable for those who wants to lose weight. This melon is similar to the spaghetti squash as their flesh will both come off in strands like spaghetti when cooked. This is how the shark fin melon looks. You don’t have to buy a whole melon for this soup as it is huge. Normally, they are sold in sections. If I’m boiling this soup for just 1 to 2 persons, I will request the vegetable seller to cut it into a smaller section for me. 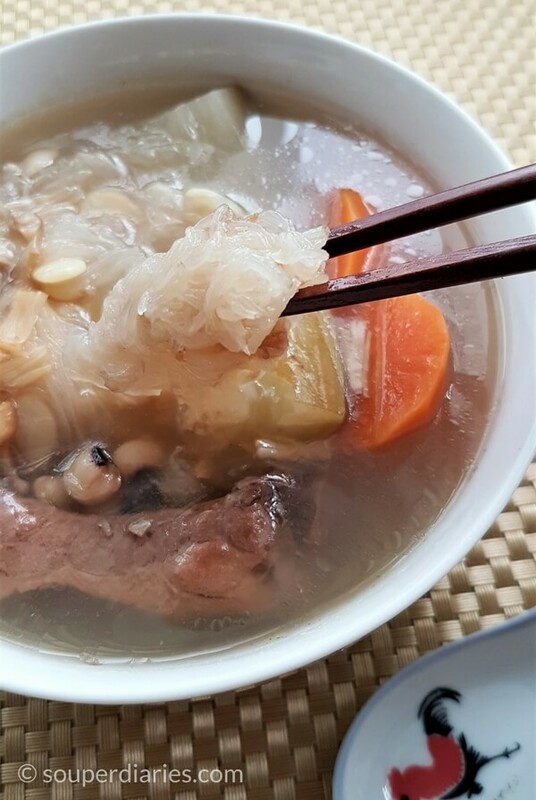 In my original recipe for this shark fin melon soup, I peeled the skin and removed the seeds. I find that it is too tedious and time consuming so this time round, I decided not to peel and de-seed the melon. Surprisingly, the seeds turned out soft and were edible after cooking. There is also less wastage this way. The skin also helps to hold the flesh; much like old cucumbers when cooked in a soup. I added black eye beans this time. They’re cream colored beans with a small black speck that resembles an eye hence the given name. These beans helps with digestion, provides fibre, protein, potassium, folate and iron. They’re also low in fat and calories. I can eat a bowl of rice with just this soup alone as it is quite filling. Cut the shark fin melon into big chunks. This way, you’ll have longer ‘noodle strands’ when the soup is done. Slice the shark fin melon into big chunks if you want longer ‘noodle strands’. 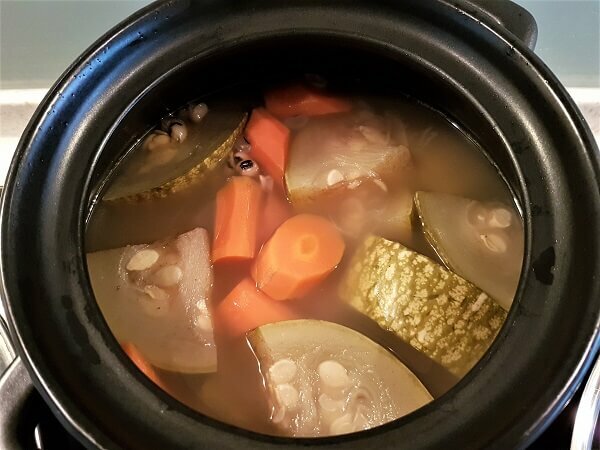 I used a clay pot for this shark fin melon soup. Clay pots are one of my favorite soup pots. I find that it helps to bring out the flavors better and it retains heat well. Read this article for more soup pot choices. Usually when I boil soups, I would use enough water to submerge all the ingredients. But for this soup, the I use slightly lesser water than the ingredients as the shark fin melon will shrink and also release some liquid as it cooks. Shark fin melon soup after 2 hours of gentle simmering in a clay pot. Now comes the fun part. The eating! This soup is a big hit with my children as they love the strands of ‘noodles’. 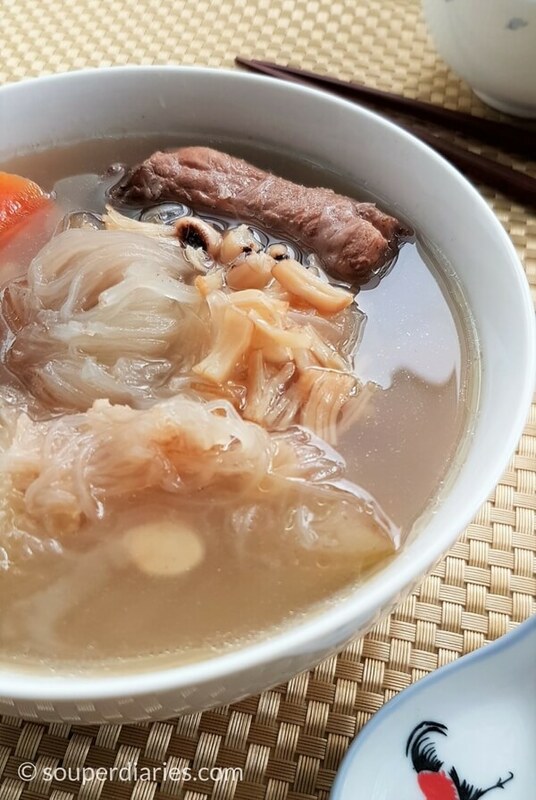 The soup has a sweet yet savory taste from the dried scallops, dried honey dates and pork ribs. I’ll let you in on a little secret. I didn’t even have to season this soup with any salt! But go ahead and season with some salt if you wish. It’s quite amazing to see the melon flesh falling away from the melon into noodle-like strands. The texture is like noodles too. Just that it is … vegetable noodles? If you have little kids at home, I think they will like this soup too. Don’t want to miss a recipe? Sign up for Souper Diaries newsletter delivered to your inbox! Stay in touch on Instagram, Pinterest, Twitter and Google+ for the latest updates. See you again and happy cooking! 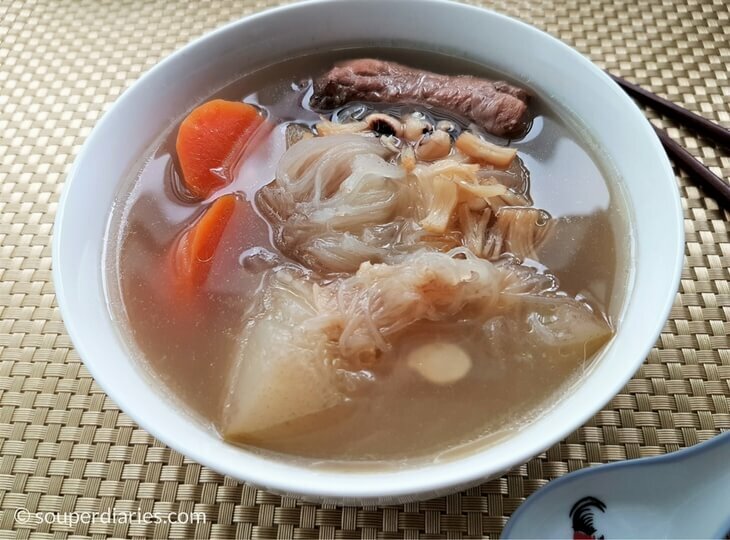 Healthy and nutritious shark's fin melon soup cooked with pork spare ribs, dried scallops, black eye beans, carrots and honey dates. Blanch pork ribs in hot boiling water for a few minutes to remove impurities. Remove and set aside. 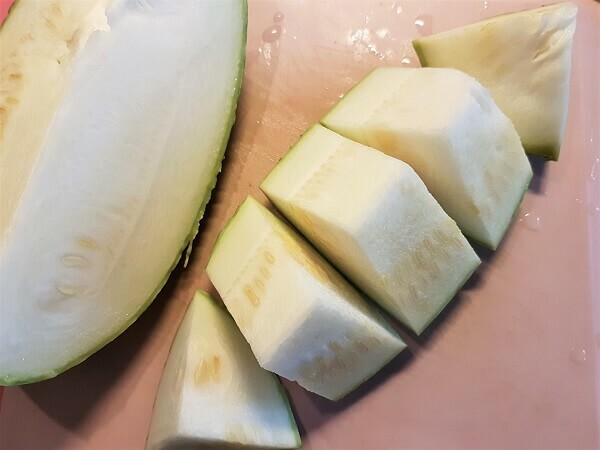 Wash shark fin melon and cut into big chunks. Put all ingredients into a soup pot and bring to a boil. Then simmer over low heat for around 2 hours. Season with salt to taste and serve hot. 1. This recipe is enough for 2 meals for a family of 5. You can adjust the amount of ingredients according to how many people are eating. I tried this recipe with some tweaks and it came out beautifully! I’m a fan. Was pleasantly surprised at how hearty it was with such basic ingredients. Having lived in Hong Kong soups were part of my everyday meal. Yet it’s my first time getting fully immersed in its cuisine. Next step, some double boiler pots. Do you have any suggestions which soups taste best double boiled? Thanks Yvonne, your blog is truly inspiring! You learn something new every day! Never before heard of shark fin melon and now I’m intrigued! As a health coach, I’m always looking for healthy foods to expand my clients’ diet. I love this recipe, it looks delicious too! Your tip on the clay pot was excellent, I’ve never known about clay pots before either. With soup season upon us, it’s a timely tip. Will share! Oh my gosh, you have me drooling here with your awesome pictures! The recipe seems simple enough but I wonder if I can find all the ingredients easily where I am (AZ). I want some of that soup now! Yum, thanks for your info Yvonne! Thanks Grace! You can purchase the dried ingredients from Asian dried goods shops. I’ve also added links to the products on Amazon for your convenience. your recipes always look so good! So appetizing. Do they come out looking this great every time?? Lol. I have never heard of shark fin melon but I find it quite interesting. So if I understand correctly, it is considered a vegetable. It reminds me a lot of a spaghetti squash and those vermicelli noodles. And I love both! I am curious as to what it tastes like. What would you compare it to? Thanks for your comments and sorry for the late reply! Yes, shark fin melon is similar to spaghetti squash. I find it fun to eat all the noodle-like strands. The taste reminds me of winter melon but it is slightly sweeter. When boiled, it is quite bland to eat it on its own as the sweetness would’ve been extracted into the soup. The texture of a cooked shark fin melon makes it a popular choice to use in dishes such as vegetarian shark fin soup. I read that you can substitute spaghetti or pasta with spaghetti squash or shark fin melon strands. Roast the melon in the oven. Once it is cooled enough, scoop out the flesh with a fork and mix it with your prepared pasta sauce/pesto. Hi Yvonne! I’ve never heard of Shark Fin Melon before, so that was interesting to learn about. Thank you for sharing the photos, it’s nice to see the processes you did to make the soup. I’ll be honest, I’m not really a fan of melon, but I’ll definitely share this with my family as they’re big melon fans…and my sister is really keen on Asian food too, so think she might enjoy this. I’m so glad I came across this website! My family love soups, but I only have a few soup recipes I make, none of them Asian. I can’t wait to try some of these Asian soup recipes! I’m not familiar with the Tiger Thermal Magic Cooker. Can I use a regular pot? Do you have an article or review of the Tiger Thermal Magic Cooker, so that I can take a closer look at it? Thanks!